Pre-kindergarten classes in the Altmar-Parish-Williamstown Central School District have been busy learning all about animals as part of the animal domain of the New York State Common Core curriculum. 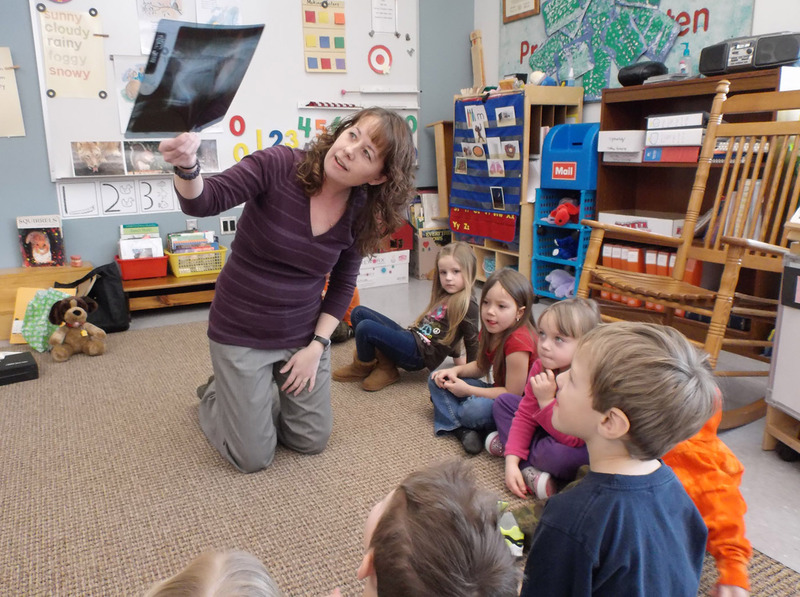 Dr. Ariane Hamblin shows Altmar-Parish-Williamstown pre-kindergarten students what an X-ray looks like during a recent visit. Dr. Hamblin practices veterinary medicine and spent a day with the students to talk about her job and how she treats her patients. Her visit was coordinated in conjunction with the students’ classroom unit on animals. Engaging activities coordinated by classroom teacher Sherrie Everett’s have had students exploring several different animals and identifying characteristics and body parts that animals and humans have in common and also how humans and animals might differ. In conjunction with the classroom activities and literacy building skills, the students were introduced to a former APW graduate who now owns and practices veterinary medicine at the Black Creek Animal clinic in Fulton. Dr. Ariane Hamblin spent an entire day in the pre-kindergarten classroom talking about her job and the animals that she keeps healthy. She brought X-rays with her to show the class as well as dog teeth and even a model of a dog’s kneecap. She also brought some of the medical equipment that she uses on the animals that come to her clinic. 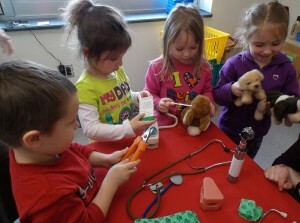 Doctors for the day are Altmar-Parish-Williamstown pre-kindergarten students Brady Robinson, left, Lexi McNabb, second from left, Cali Painter, second from right, and Marina Bennett. The students are using some of the medical equipment veterinary doctor Ariane Hamblin brought with her during a recent visit to the class. Dr. Hamblin was invited to speak to students about her job following a classroom unit where students learned about different animals and their identifying characteristics. Dr. Hamblin showed the students how she exams an animal’s eyes, ears, and heart and the students were able to see similarities between an animal doctor and a doctor that treats humans. The APW pre-kindergarten program is a half-day program that is aligned with the New York State Common Core Learning Standards and provides a variety of exciting educational experiences to help students develop academically, socially, and emotionally as well as achieve their highest potential. The program is operated with a state grant and is offered at no cost to children in the school district. For more information about the pre-kindergarten program, contact the APW Elementary School at (315) 625-5260.